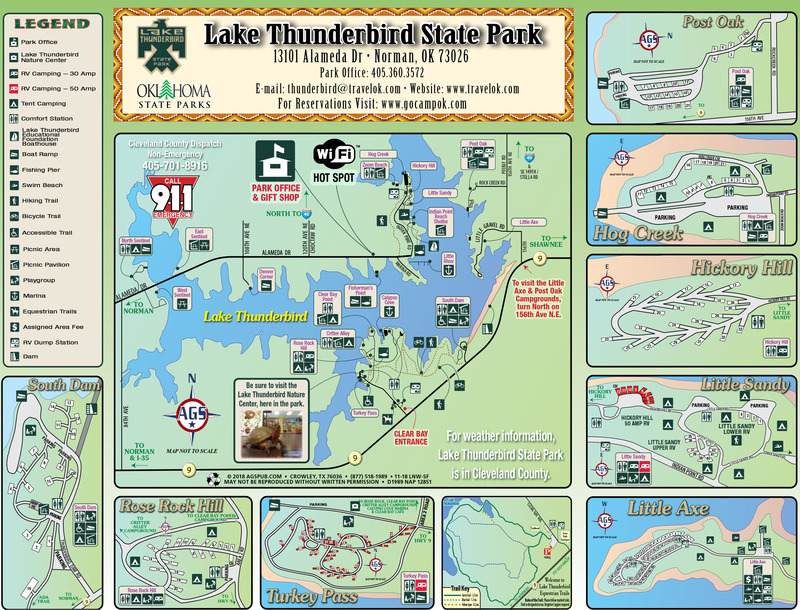 Ask fellow campers about "Lake Thunderbird State Park" and nearby attractions. We stayed at Little Axe campground. We had a site right on the water. Lovely clean, tidy park. We camped at Lake Thunderbird State Park in a Travel Trailer. Many of the camping areas were closed due to the time of year that we stayed. We were able to choose a FHU spot by the water that had a lot of trees around and a nice view. It was very peaceful and quiet being so far away from any roads (major or otherwise) and just a few other campers. A bit of a cruise to get to anything, but that's what being in the middle of the wilderness gives you. The only hiccup was when they turned off the water in the middle of the day with no warning for repairs. After we inquired with the camp hosts (who had no idea that it was occurring) we learned that this was supposed to be a quick repair. However, Murphy's Law kicked in and it became a bigger deal than they had anticipated. Something broke and the water was off for quite a few hours. Kudos to the park maintenance team, however, since they worked into the night and didn't give up until it was back on. Stuff happens... We camped at Lake Thunderbird State Park in a Travel Trailer. The National Weather Center is in Norman and they provide free tours a few times during the week. You can't take the tour by just showing up but it is easy to sign up in advance on the website. It wasn't anything out of this world, but it was a cool thing to do since we were in the area. We stayed in a full hook up site at Axe. However no sewer. The flies were unbelievable. We couldn't enjoy our campsite at all. Just rush in and rush out of rv. Killed 40 flies at least the first night. So disappointed as we were lakefront but couldn't enjoy. 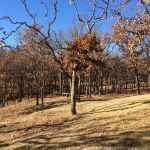 We camped at Lake Thunderbird State Park in a Fifth Wheel. Our second time to stay at Hickory Hill Campground. There are full hookups at this campground. The sites are back in and nicely spaced. A few are waterfront. Shade is abundant. All utilities worked well. Price includes $2 per day senior discount. There is no entry fee to the state park. We camped at Lake Thunderbird State Park in a Travel Trailer. We stayed in the Crystal Bay camp ground area off of OK Hwy 9. The sites have very good level concrete pads. Most have cooking grills and fire pits. Most if not all sites have 50 amp service. There were only a couple of pull throughs, but the way the park is laid out back-ins are very easy to use. We stayed at site 43 which has a great view of the lake and is near the boat ramp. Since it off season it was fairly quiet. The spaces are well dispersed for the most part. There are some that are close together if you need that for group travel. Water and electric are all that is available within the camp ground. There is a dump station near the entrance to the park and the $5 fee is included for registered campers. Restrooms were adequately clean, but not what you would call sparkling. Cellphone service with AT&T was excellent. Many TV stations off the antenna. All of the major networks are available. The park has lots of trails to hike. Most of them are short duration and fairly level but in the woods which makes for great bird watching. There is a small nature center in the park but it's only open Thur-Saturday. Park Ranger cruised the camp ground regularly through the night. This was a great place to de-winterize the RV and get ready for the coming season's adventures. We would definitely stay here again. We camped at Lake Thunderbird State Park in a Travel Trailer. There is a Country Boy grocery that is well stocked with very reasonable prices about 4 miles east on OK Hwy 9. The Thunderbird Casino is about 2 miles east on Hwy 9. They have a restaurant there and full blown casino. There is a Sonic Drive In about 3 miles east on Hwy 9 as well as a Dollar General. Heading back 10 miles west on Hwy 9 towards I-35 there is a McDonalds, Taco Bell, and Buffalo Wild Wings at US 77 and Hwy 9. Several spots to choose from, we stayed at the Hickory Hill area. Camp host was very helpful and polite. Fishing from the shore was poor but still had a good time. There are hiking trails that are well kept and provide the chance to view some of the local wildlife. Our parking spot had water and electric only which was fine because we only stayed over the weekend. We camped at Lake Thunderbird State Park in a Motorhome. Nice park near Norman, but a bit of a drive if you need to be in town each day. Verizon JetPack worked really well. This park has multiple camping areas, some with 50 amp power but no sewer hookups near the Nature Center, others on the other side of the lake are full hookups but only 30 amp power. Look closely at a map or call before you go. We had been there for a day visit once before and our map program routed us to the other side of the lake this time, oops. Arrived there in a rain storm and it was very muddy but other than than no complaints, very friendly staff. They offer a Good Sam's discount but you need to ask for it. 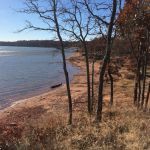 We camped at Lake Thunderbird State Park in a Fifth Wheel. We stayed at Little Axe annex, which is a bit different than other camping areas of the lake. Our pull-through site was right along the shore with a concrete pad, shade, table, fire ring, but 30 amp and no sewer. 50 amp sites are pretty tight and back in. Big clean showers, perhaps because we were the only ones there except for a small surge of weekenders. Quiet. Goat-head stickers abound, along with a herd of cats. We camped at Lake Thunderbird State Park in a Motorhome. This is a huge park with campgrounds in a number of areas. I was the only one camped in my area, which was on a little hill with a great view of the lake below. The rangers in the office that took my payment were friendly and helpful. The park was not overly crowded, so it was like having my own property on the lake. Although there are near empty dumpsters a very short distance from most campsites I had to clean up after prior campers who thought the fire pit was their trash can. Otherwise grounds were clean, and the sunset over the lake terrific! We camped at Lake Thunderbird State Park in a Travel Trailer. Would give higher rating if people picked up their trash. Little Sandy area only section with 50 amp service and sites for larger rigs. 14 day max stay may be extended to 28 days with management approval. Longer stays require proof of medical treatment. Swimming, boating, fishing in huge lake. Hiking trails and archery range and cafe at different areas around the lake. Far from any highways but worth the trip for piece and quiet (except on holiday weekends). We camped at Lake Thunderbird State Park in a Motorhome. Nice and quiet, lake is very low, colors of trees very pretty, WiFi available at campground office. Great trails for dog walking, few people here during week. We camped at Lake Thunderbird State Park in a Motorhome. This state park has large, shaded sites with a lot of space between each site. We stayed in the Hickory Hill campground which has full hook-ups. The majority of the sites in the park have electric/water only. The camp host was friendly and the park was quiet at night. We would camp here again. We camped at Lake Thunderbird State Park in a Travel Trailer. This is an excellent State park campground with electric and water. Sites are concrete and roads are paved. I am referring to the southside Turkey Pass unit. Lots of shade trees and next to the boat launch. We camped at Lake Thunderbird State Park in a Motorhome. State park with newly concreted paved sites; many not quit level, paved roads, some shade. Bath room and shower unfortunately had many bugs crawling about floors; you paid 50 cents for 3 minutes of shower flow or 75 cents for 4 minutes. Put your money in a coin control box seems rather dinky for $25/night campground. Lake with boat ramp close by and stables with horses. 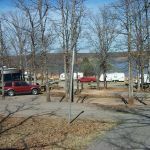 Apparently there are several sections of the campground at Lake Thunderbird. We were an overnighter on way west and few possible campgrounds in area. We camped at Lake Thunderbird State Park in a Motorhome. Nice level sites, not busy at this time of year, have to get your permits from the camp host. Very quiet. We would definitely come back again. 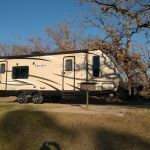 We camped at Lake Thunderbird State Park in a Fifth Wheel. 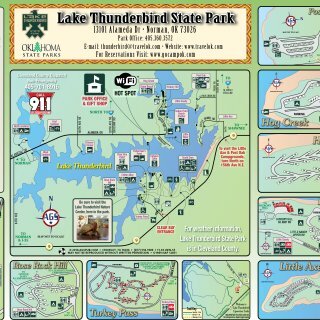 Are you affiliated with Lake Thunderbird State Park ?